The strong growth and future prospects for online video for SMBs were discussed by three notable panelists involved in this area at SMB Digital Marketing. 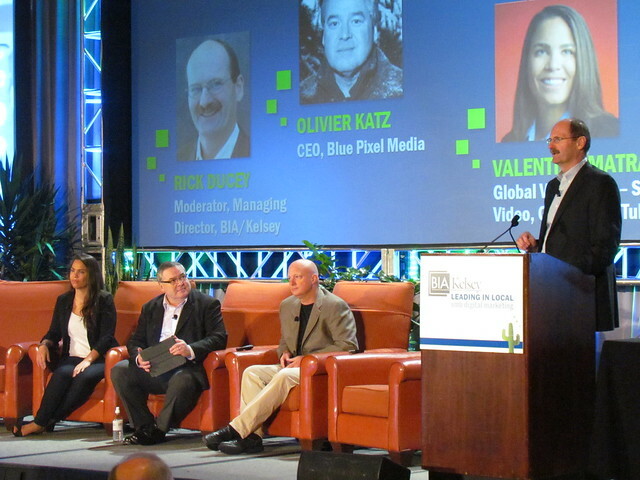 Led by moderator, Rick Ducey, Managing Director at BIA/Kelsey, these panelists covered the extraordinary growth in recent years for online video growth. While there has been substantial growth in overall online video advertising, only 1/3 of all SMBs are using online video according to BIA/Kelsey’s most recent Local Commerce Monitor survey. Olivier Katz of Blue Pixel Media started off the session with a thoughtful speech on what is needed for future growth of online video for SMBs. Three words are paramount: Adapt, Respect, and Evolve. Adapt is simply tailoring the online video advertisement for different types of businesses, campaigns, and media format. Respect refers to respecting the audience, SMB, and media consultant when creating the online video campaign. Finally, evolve represents changing online video campaigns as consumers and businesses change. Valentine Matrat of Google/You Tube followed those opening remarks with a thorough review of how to be successful with online video. She started her presentation by suggesting that the historical funnel of starting with broad based mass media will be inverted with a more directed form of advertising via online video and other digital media. * Add value not clutter then steer the conversation and study the signals; remember that online video viewers can turn away from the message at any time. * Launch, Listen, Learn – measure the impact of your ads and gain insights about your audience. John McIntyre of Sightly, finished up the panel with an engaging discussion of the explosive growth of online video. There are 187 million viewers on online video in the U.S. compare with the 297 million of TV viewers. Online video ads have doubled in the past year alone. He also provided some suggestions on how to most effectively run an online video advertising campaign: Be very hyper local, have strong call to action messages, and study very intensely the statistics surrounding the viewing of these ads. When it is all said and done, the future for online advertising is extremely promising. The panelist at this session clearly showed the reasons why and that the growth should be phenomenal in the coming years.